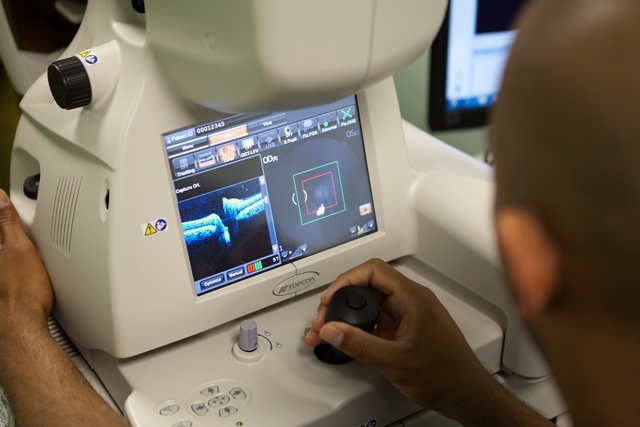 A breakthrough study led by two Moorfields Private consultants suggests regular eye tests could help identify those likely to get dementia at a much earlier stage. Consultant eye surgeons Professor Paul Foster and Mr Praveen Patel are both lead authors on the study which concluded that thinner retinas – the light sensing tissue that lines the back of the eye - are a clear sign a person is at significant and increased risk of future mental decline. News about study has been reported in The Economist, The Mirror and The Sun. The research team from Moorfields Eye Hospital and UCL assessed UK Biobank data from 32,000 anonymised participants who had undergone a series of tests on memory, reaction time and reasoning. Researchers then compared results with measurements taken from optical coherence topography scans (OCT), which measures the thickness of a layer of neurons on the retina. Researchers noticed that the retina nerve fibre layer was significantly thinner among participants who performed abnormally on cognitive tests. People with thin retinas were twice as likely to perform poorly in subtle tests on everyday memory and reasoning - and twice as likely to suffer mental decline within a three year period. (Above) OCT scans are a non-invasive way of imaging the back of the eye. The collection of eye and vision data on UK Biobank was funded by The National Institute for Health Research (NIHR) Biomedical Research Centre at Moorfields Eye Hospital NHS Foundation Trust and UCL Institute of Ophthalmology.